I'm an indie author writing epic fantasy, and my website will introduce you to me, my books, giveaways, and other related information. In particular, I'd like to introduce you to my new series. How would it change your world if you could suddenly peer into other people's minds? 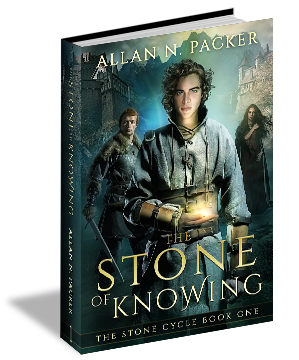 The Stone of Knowing begins a new saga that traces the lives of ordinary people facing extraordinary circumstances at a time of growing conflict between nations. The story follows the upheaval that stems from the intrusion of a small object of unusual power into an otherwise normal world. *The Rending is a free download available to readers who subscribe to my mailing list. It can be read before The Stone of Knowing or The Cost of Knowing, but the recommended reading order is after both novels have been read. In the kingdom of Arvenon, young Thomas Stablehand stumbles upon an unusual stone. Suddenly able to read the thoughts and intents of others, his life sours as he eagerly indulges his curiosity. But dangerous enemies seek the stone. With overwhelming forces attacking the kingdom, Thomas has no one to turn to except Will Prentis, a born leader who has seized his opportunity to command. To thwart the invaders, Will must lead a small band on a perilous quest. Fearing exposure, Thomas flees with him, along with Brother Vangellis, a conflicted monk hiding from his past. They can ill afford distractions, least of all a fiery young woman with a sharp tongue. But more may depend on Elbruhe than they can foresee. As Thomas struggles to unravel the enigma of the stone, Will must outwit a relentless adversary whose true purpose remains a mystery. Staying alive is a formidable challenge. Defeating their enemies seems an impossible dream. Thomas Stablehand’s life is not the only thing spinning out of control since he found the stone. Entire kingdoms are now in turmoil. As war clouds darken the horizon, unlikely heroes will arise. Will Prentis, newly appointed as army commander, must outmaneuver a growing array of enemies as he prepares for an unequal showdown with Arvenon's invaders. Thomas, hunted unceasingly and aided only by Brother Vangellis, must sacrifice all to safeguard the stone. The fate of kingdoms soon hinges on them and on Essanda, their new queen, who is easy to underestimate but may have surprises of her own in store. Together they must confront a ruthless invader hiding a darker purpose. Subscribe to my mailing list to be kept updated on new releases, sales, and giveaways. You can expect emails to be irregular and infrequent—I won't send newsletters without a reason. 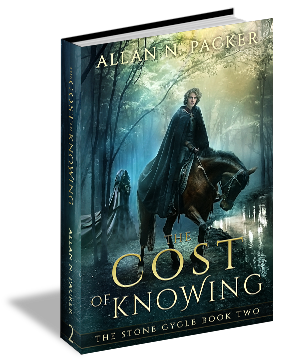 New subscribers will also receive an exclusive bonus novelette—a prequel to The Cost of Knowing that provides further background to one of the story threads in that novel. The prequel, The Rending, is a complete story four chapters (13,000 words) in length. It can be read at any time, since it does not introduce spoilers for either The Stone of Knowing or The Cost of Knowing. It is, however, intended to be read after both of those novels.